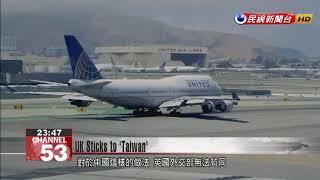 In April, China demanded that global airline carriers change their terminology for "Taiwan" on their websites. So far, 20 carriers have complied with the request, but a UK foreign office Minister of State, Mark Field, has made a bold move in defense of the term "Taiwan." In a statement, he said the UK government had expressed its concern to Beijing, and that UK companies should not be pressured into changing their terminology. He also said the UK government would continue its long-standing policy of calling Taiwan "Taiwan." Air India changed the name of “Taiwan” to “Chinese Taipei” on its website last week, unable to withstand political pressure from Beijing. Back in April, China had asked 44 airlines to change their “Taiwan” listings to indicate that it is a province of China. As carriers around the world comply, the UK’s foreign ministry has spoken out against the request. Yesterday the UK government – the UK minister of state made a statement in reply to parliament. He opposed China’s bullying. We are grateful that western countries, and countries with similar values, have rejected China’s bullying. We are also impressed with their moral courage. To this day, three US carriers – United, American Airlines, and Delta – continue to use the name “Taiwan” on their websites. So far, only 20 of the 44 carriers targeted by Beijing have made the change.